I was a middle aged tub of lard! : Dumbbells are essential! If there was only one piece of weight lifting equipment you could own, it would be dumbbells. Even a single dumbbell provides dozens of potential exercises for your routine. Dumbbells are not expensive, and you can even get high quality components second-hand. 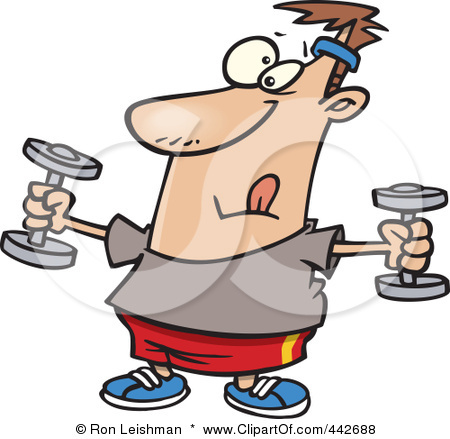 Dumbbells don’t take up a lot of storage space, and you can work out with dumbbells in a very limited amount of space. A pair of dumbbells doesn’t take up much more room than a single dumbbell, and isn’t any harder to acquire. Dumbbells are extra effective because they are less stable than a barbell, and require your muscles to stabilize the apparatus at the same time that the exercise is being executed. I have three pairs of dumbbells that I love. My light dumbbells are great for warming up and learning to exercises that I want to add to my routine. My medium weight dumbbells are my work horses. I do most of my workout routine with my medium dumbbells. They are heavy enough to provide a challenge, but not too heavy to do multiple reps.
My heavy dumbbells are a great challenge for exercises when I really want to push myself. My favorite exercise of all is the dumbbell fly. I use my light dumbbells to do a variety of flat bench and inclined bench curls and flys and presses. I use my heavy dumbbells to do flys that I do lying on the floor. If you haven’t committed to a weight lifting program yet, go get some dumbbells.